Check out the Ferberite Crystal Cluster with Arsenopyrite & Quartz, Quartz var. Amethyst, Neptunite & Benitoite Crystals on Natrolite, Fluorite with Calcite & Barite, Ametrine, Epidote Crystal Cluster with Quartz, Calcite on Quartz with Galena, Prehnite Crystal Cluster with Apophyllite, Magnetite Crystals on Matrix, Iridescent Chalcopyrite Crystals on Dolomite, Manganocalcite on Quartz with Sulfites, Light Yellow Quartz Sprays on Calcite with Anhydrite, Copper Nuggat, Purple Fluorite Crystals, Dioptase Crystals with Quartz & Chrysocolla, Fluorite Crystals on Lollingite, Green Quartz Crystal Cluster with Chlorite, Selenite Sand Rose, Quartz Epimorphs after Calcite & Anhydrite, Wulfenite Crystals on Matrix, Cobaltoan Calcite, Stibnite, Augelite Crystals with Quartz & Hubnerite and Calcite Crystal Cluster with Blue Chalcedony mineral specimens on this page. Beautiful specimen featuring light yellow Quartz sprays on sparkling Calcite with thin Anhydrite crystals. In fine condition. A super. 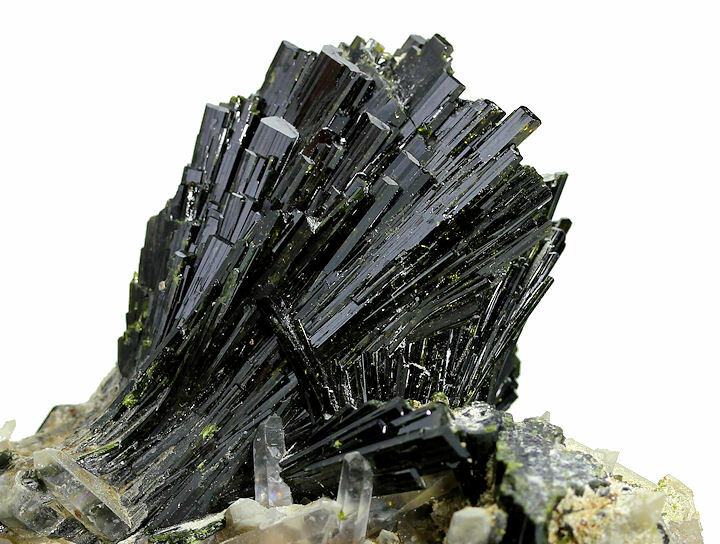 large cluster of lustrous, jet black Ferberite crystals with silvery Arsenopyrite and minor Quartz. Aesthetric array of Amethyst crystals on matrix. Very nice specimen of jet black Neptunite crystals with some small Bentioite crystal on a Natrolite matrix. Large aesthetic specimen of gloden Fluorite with Calcite and Barite crystals from the Moscona Mine. Stunning cluster of purple tipped Quartz var. 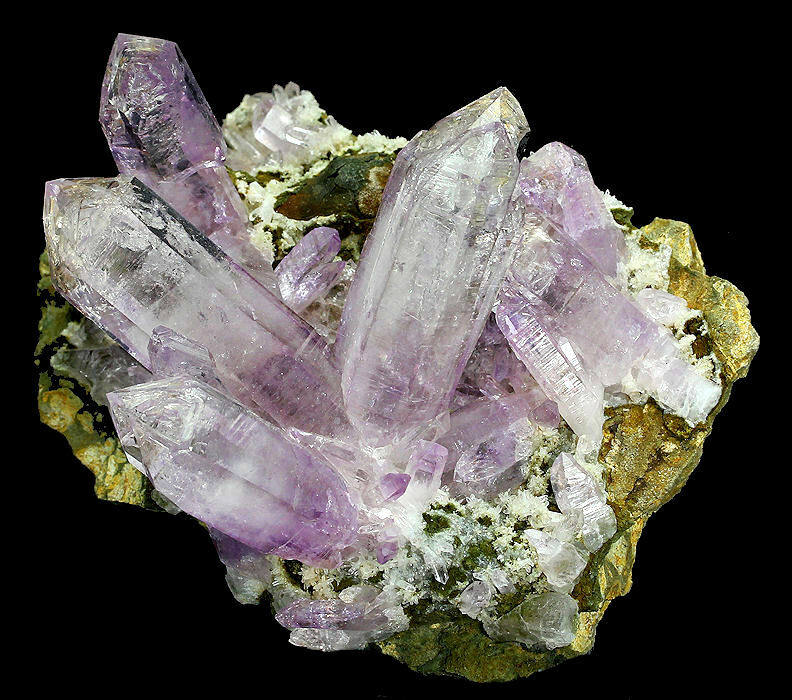 Amethyst crystals from the Anahi Mine in Bolivia. In fine condition. A unique variety of Quartz from the finest occurence in the world. Ametrine is a naturally occurring purple and yellow bi-colored variety that is formed by a unique twin law ("Brazil Law twinning"), where two separate individually colored crystals are intergrown to form an alternating pattern of purple and yellow triangles when viewed down the c axis. he crystal is very translucent with a natural hydrothermally etched surface. 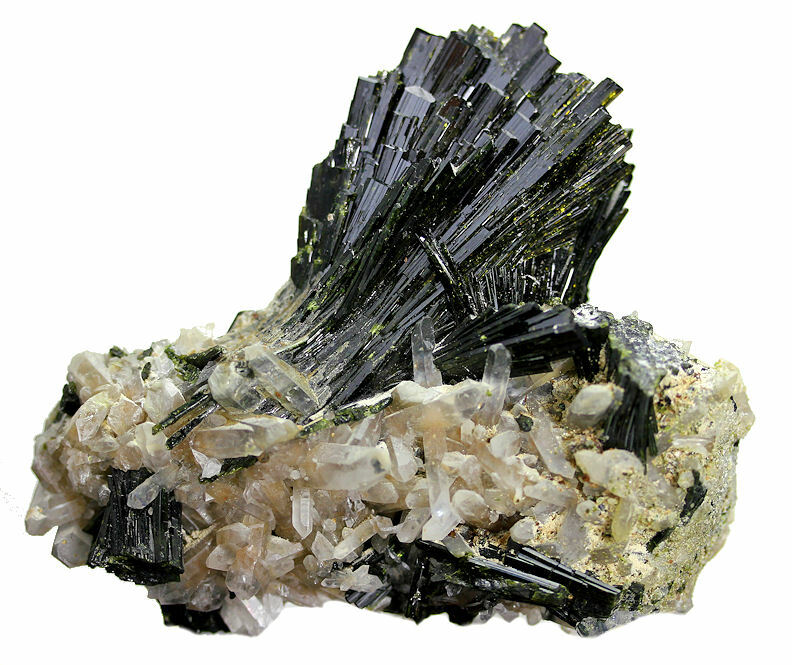 A fine spray of dark green Epidote crystals on matrix with Quartz. In fine condition. A super large cluster of gemmy, golden Fluorite crystals with a fine dusting of Calcite crystals from the Moscona Mine. In very good condition. Interesting cluster of Quartz points coated with a fine, light tan Calcite and associated with several small groups of white Calcite and some small Galena crystals. Large, double terminated, yellow to golden Calcite crystal from the famous Elmwood Mine. In very good condition. Comes with a custom made stand. 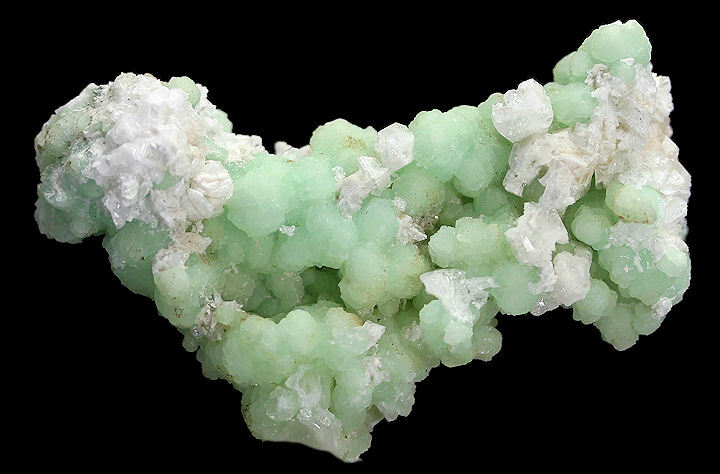 Light mint green, botryoidal Prehnite crystals with adorning Apophyllite crystals. Nice plate of octahedral Magnetite crystals. Pretty plate of multi-colored, iridescent Chalcopyrite crystals on Dolomite. Light cream colored, glistening Manganocalcite crystals on a matrix of Quartz and Sulfites. 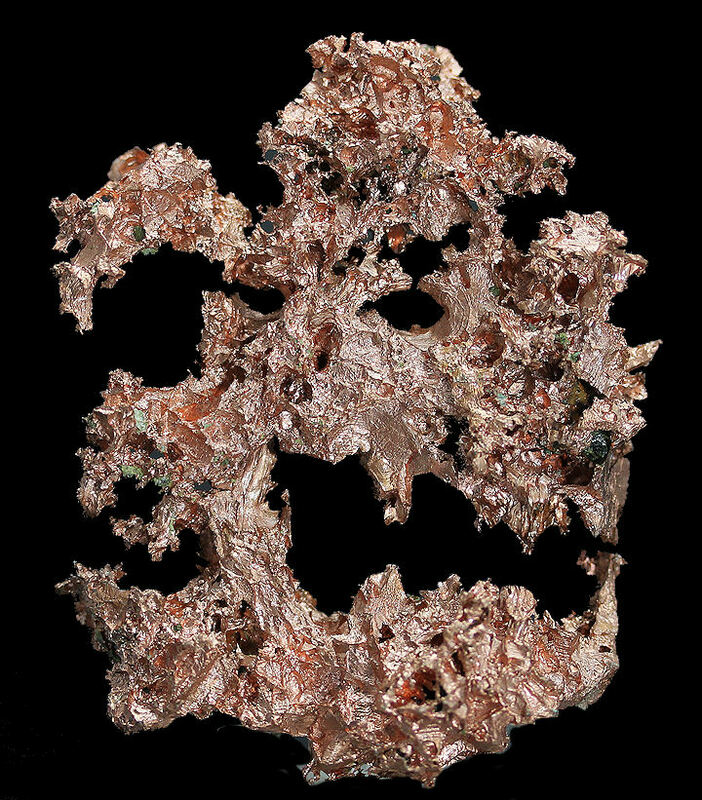 Scary looking Copper nuggat formation from Michigan. Attractive coverage of octahedral purple Fluorite on matrix. Cluster of gemmy, dark green Dioptase crystals with Quartz and Chrysocolla. Light golden Fluorite crystals with outer purple zoning from the Minerva Mine. Silvery Lollingite crystal clusters adorned with complex, glassy Fluorite crystals from new finds in the Inner Mongolia region of China. Numerous crystals of Quartz colore green with Chlorite inclusions from the Ganesh Himal region of Nepal. Very nice specimen of translucent green Fluorite crystals from the Okorusu Mine. 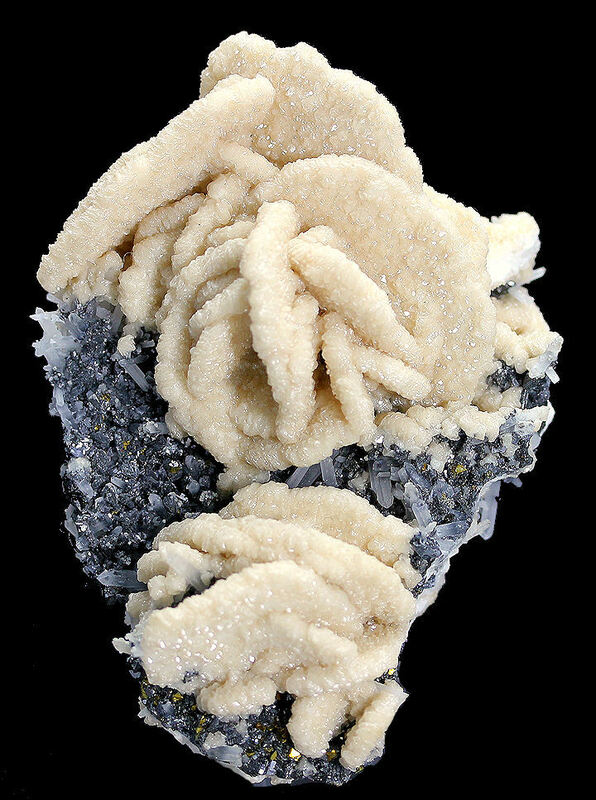 Unusual specimen of Quartz epimorphs after Calcite and Anhydrite. Much better in person. 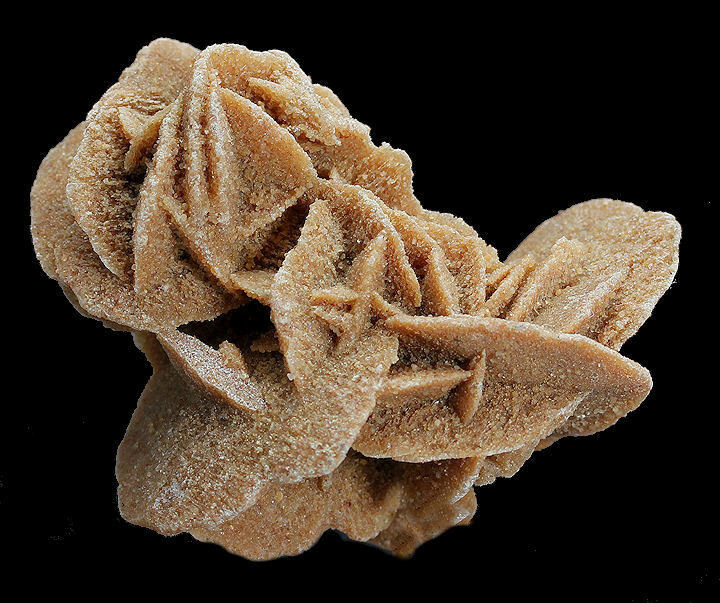 Lustrous, translucent, butterscotch colored Wulfenite crystals ( to 1 cm) richly cover a gossan matrix. 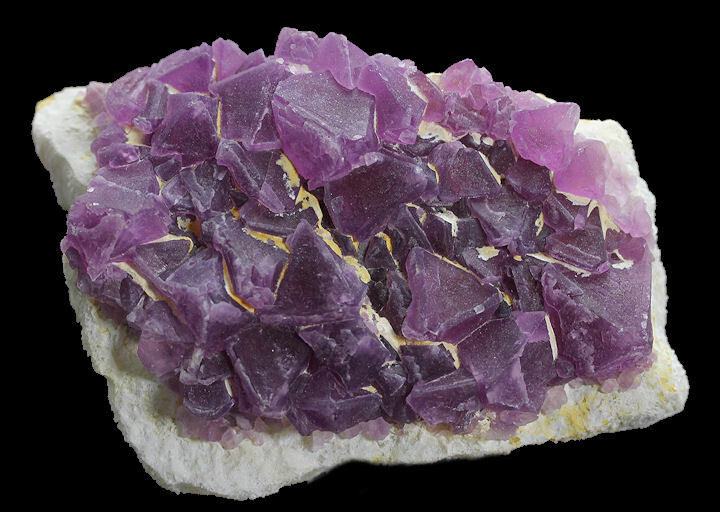 Attractive cluster of Amethyst (Cactus Quartz) crystals. Lustrous green pseudorhombohedral Augelite crystals with Quartz and minor Hubnerite. A not well known phosphate mineral first described by Christian Wilhelm Blomstrand for an occurrence in Västanå iron mine at Scania, Sweden in 1868. 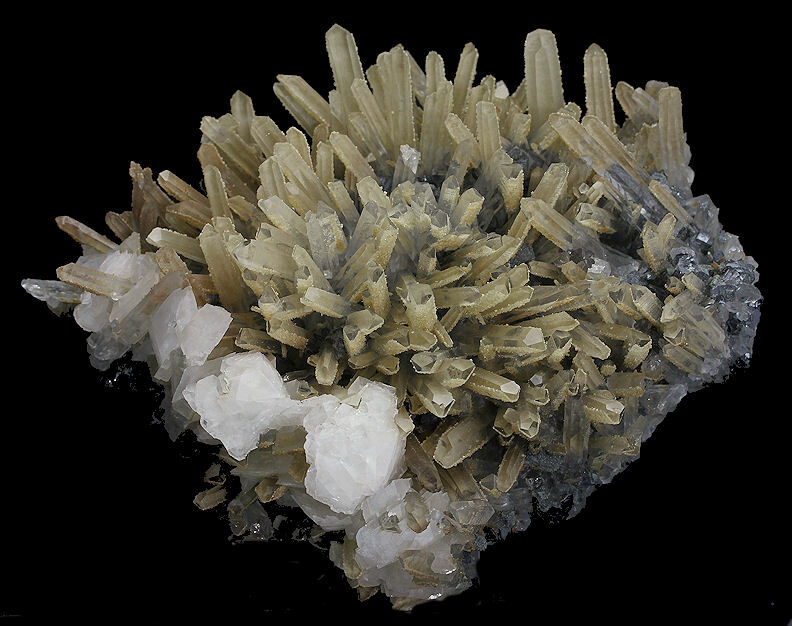 A unusual, aesthetic cluster of highly translucent, pale yellow Calcite crystals with patially intergrown strands of blue Chalcedony. Beautiful cluster of lustrous, hematinic Quartz crystals from recent finds in Morocco. Radial aggregates of acicular Stibnite crystals. 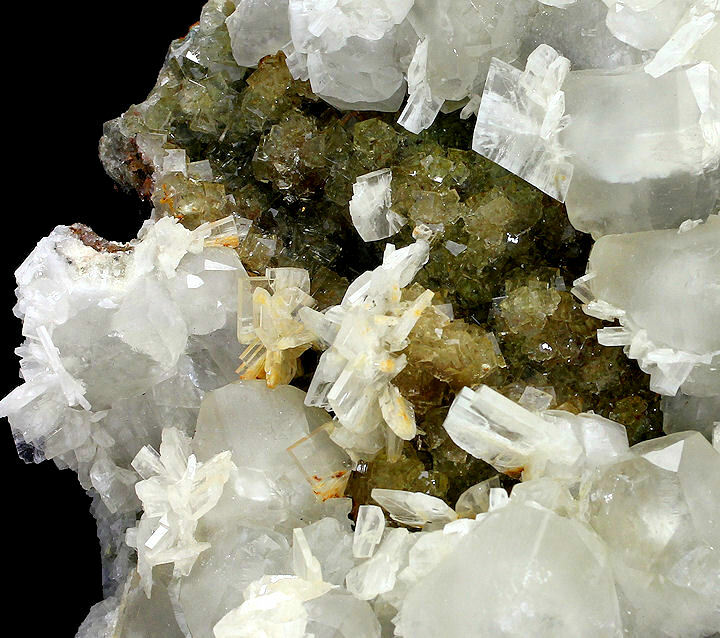 The crystals are very bright and with small Calcite crystals intermixed. Very nice specimen from the now closed Herja mine.